Students and families gathered at Carver Community School for the Bike Rodeo, co-sponsored by the Des Moines Bicycle Collective and Viva East Bank. It is the job of the schools to equip their students as fully as possible for the road ahead of them in life, right? Sometimes the task is taken so literally as to include arranging bikes for kids without them. That was the case at Saturday’s Bike Rodeo hosted by Carver Community School, an event jointly coordinated by Viva East Bank, the Iowa Department of Transportation, the Capitol Park Neighborhood Association, the Des Moines Bicycle Collective and DMPS. It was potentially the biggest such event the bike collective has been a part of yet and months in the planning. All 580 Carver students were eligible to participate. The DMBC is a nonprofit community bike shop that provides opportunities for education, empowerment and social change through bicycle restoration and charitable bicycle donations. Flashing turning signals and broad smiles all the way, the brothers Boone completed a nine-station course that stressed safe riding habits on loaner bikes provided by the Collective and were rewarded with helmets, bike locks and, most importantly, a voucher redeemable at the DMBC shop in the East Village for a bike to take home. 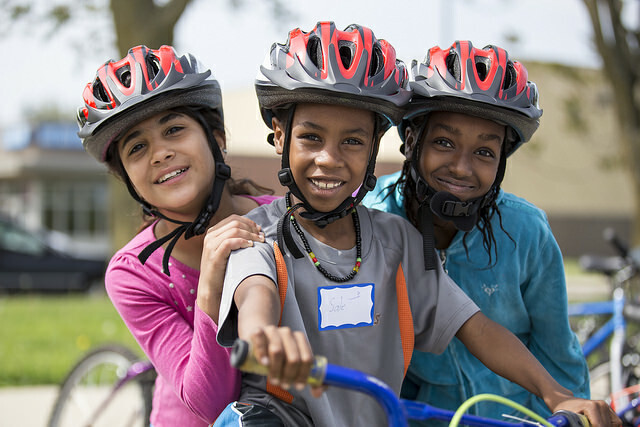 “Having a bike to ride will help our kids to stay active this summer, and the helmet and lock will help to keep both students and bikes safe,” said Jill Burnett- Requist, Carver’s principal. Together the safety stations were a crash course in not crashing. The rodeo riders demonstrated their understanding of hand signals, change of direction and stops/starts. They slalomed between cones and stayed within the bounds of the temporarily white-striped course, learning the dos and don’ts of life on two wheels. Not all of the registrants were as experienced as Patrick and Glen Boone. Many not only didn’t have bikes, they had no experience or training as bikers. So the rodeo made sense as a prerequisite to riders cutting their very own mounts out of the herd back at the shop. Nobody was turned loose to ride home but you can bet there was a run of redeemed vouchers before the weekend was over. In all, 162 kids earned bike vouchers, according to Casey Petrashek at DMBC. Carver may soon be in need of a bigger bike rack. Once you get kids on bikes it can be hard to get them off. A bond forms, kind of like the one between cowboys and their ponies.